If you’re looking for the Wednesday Wandering, just page back for an announcement about Wolf Fest 2012 – and a really cool wolf photo! Then come and join me and Alan for a look at a very unusual gateway into a strange and wonderful addiction. gateways into the history and legends of a place. The funny thing is that, to me, the “prosaic” names are as much a gateway to the mind set of the people who gave the name as the more exotic ones are. Alan, you were talking about prosaic names. Can you give another example? ALAN: No worries! In the far north of New Zealand there’s a place called the Bay Of Islands – it’s a bay; it has islands in it. What else would you expect? Robin and I stayed there once. Round the corner from our hotel was a pub called The Pub Round The Corner. About five minutes drive from the place we were staying is a beautiful beach with lazy waves. It’s just perfect for swimming or for simply sitting in the sun. The beach is quite long; it’s called Long Beach. Your turn! JANE: Your mention of Long Beach reminds me of how confused I was when I went to college and heard people talk about a place called “Lawn Guyland.” Everyone spoke about this as if it was a place I should be as familiar with as I was with New York City. Then, one day I realized I did know what they were talking about. Lawn Guyland was Long Island. (This is a long island off the coast of New York; it includes part of New York City.) I wonder if we weren’t already a culture with a written language if the original meaning would have been lost to the dialect pronunciation. ALAN: Not too far away from Long Beach is a flagstaff on top of a hill called Flagstaff Hill. You drive up Flagstaff Road to get to it. There’s a church in the middle of Church Street. Ferries run regularly across the bay to a small town called Paihia. One ferry is painted blue; it’s called The Blue Ferry. One ferry is painted white; it’s called The White Ferry. And one ferry is painted red. It’s much faster than the other two and so it’s called The Fast Ferry. Paihia has a mall with 24 shops in it. It’s called The 24 Shop Mall. There’s a licensed restaurant with a name that cannot be read for the sign outside is written in such a distorted script as to be completely illegible. Possibly the real name of the restaurant is The Illegible Licensed Restaurant, but I’ll never know. Your turn! 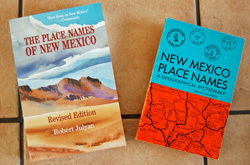 Especially where it was settled by English speakers, New Mexico has its share of prosaic place names: Cedar Crest, Red River, Grasshopper Canyon, Alkali Lake. Later, when a post office was located there (this was a sign of becoming a “real” settlement), a new name was needed. “Hope” was chosen, based either on a coin toss or on the “hopes” that the local storekeeper would make more money. Either way, there’s a great deal of history in that simple name. This entry was posted on March 22, 2012 at 1:00 am and is filed under Thursday Tangents. You can follow any responses to this entry through the RSS 2.0 feed. You can leave a response, or trackback from your own site. Or if you’re in a cynical mood, there’s a development near me, where the developer named many of the little cul-de-sacs after the plants he’d displaced. A friend of mine who has children in the local elementary school landscaped a bit of the school with those plants, just so the kids would know that those are more than street names. Some of the names I find fascinating are street names, especially here in Houston. There’s always the streets named after famous / important people (MLK), of course, and the ones named after places (Barker-Cypress), but we also have some bizarre names, like Buffalo Speedway and Stella Link. The history behind some of those names is really interesting. For a lovely combination of the exotic and the prosaic, there’s Head-Smashed-In Buffalo Jump, in Alberta. Around here, we have an old road with an old name, Mule Hell Road. I hate to think of what its genesis might have been. But my favorite was a street sign I once saw in North Carolina: Lois Lane. For deep irony, there’s Speedway Road, in Madison Wisconsin. It’s only a few blocks long, and the only things on it (as I recall) are a large cemetery, a golf course, and, all too often, a speed trap. Did I mention Speedway Road was straight,, but with a slight rise in the middle, so that you can’t see the end until you’re going faster than the speed limit? I suspect Speedway Road was named as a fundraiser for the Madison PD, but I could be wrong. Outside Madison, there’s Bong Road. It’s locally known because, back in WWII, the farmers along Bong road grew hemp for the war effort. Even to this day, the ditches along Bong Road sprout weedy hemp. Supposedly, kids go out to Bong Road to collect the weeds, but they aren’t very fun to smoke. I’m particularly fond of the names developers give streets. Some, as heteromeles noted, commemorate places that have been replaced by the developments, but others are obviously meant to sound poetic… There there’s the development where all the names are women the developer knew. First and middle names. And then there are the streets named for Hopi Katchinas. Have you ever read Wisdom Sits In Places? (BigJungleRiver Link) by Keith Basso? Dr. Basso’s an anthropologist, working with the western Apache to create a map of their territory in their own words. I’m reading it now, and it’s a neat book. I didn’t realize that for the Apache, place-names are history, and they effectively live in a memory palace, as do (did) the Australian aborigines. Neat stuff. I understand also that the Apache have suffered terribly with the fires of the last few years, as many of their places went up in smoke, and so did that history.